The use of arthroscopy has revolutionized many different types of orthopedic surgery. During arthroscopy, a small video camera attached to a fiberoptic lens is inserted into the body to allow a physician or surgeon to see without making a large incision (arthro means joint scopy means look). The knee was the first joint in which the arthroscope was commonly used to both diagnose problems and to perform surgical procedures inside the knee joint. The knee joint is formed where the femur (lower end of the thighbone) connects with the tibia (upper end of the main lower leg bone). 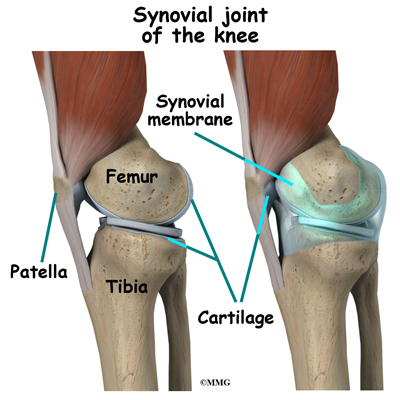 On the front of the joint is the patella (kneecap). 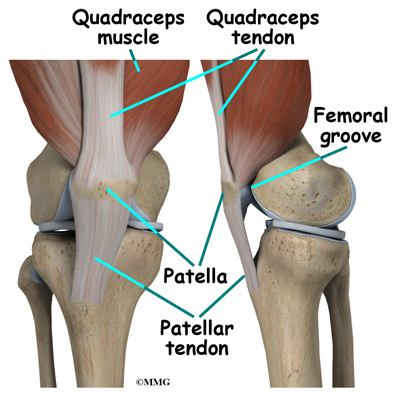 The patella is what is called a sesamoid bone that is a part of the extensor mechanism of the knee joint. The extensor mechanism connects the large muscles of the thigh to the tibia; contracting the thigh muscles pulls on the tibia and allows us to straighten the knee. The parts of the extensor mechanism include the thigh muscles, the quadriceps tendon, the patella and the patella tendon. 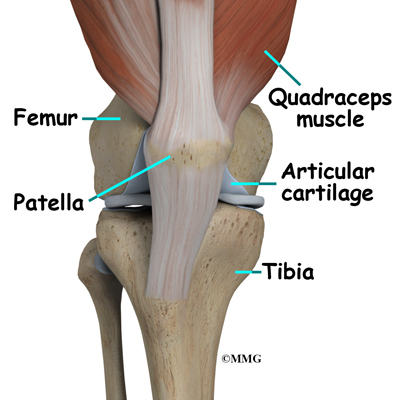 The knee joint is surrounded by a water tight pocket called the joint capsule. This capsule is formed by the knee ligaments, connective tissue and synovial tissue. When the joint capsule is filled with sterile saline and is distended, the surgeon can insert the arthroscope into the pocket that is formed, turn on the lights and the camera and see inside the knee joint as if looking into an aquarium. The surgeon can see nearly everything that is inside the knee joint including: (1) the joint surfaces of the tibia, femur and patella, (2) the two menisci (plural for meniscus), (3) the two cruciate ligaments, and (4) the synovial lining of the joint. Ligaments are tough bands of tissue that connect the ends of bones together. The Anterior Cruciate Ligament (ACL) is located in the center of the knee joint where it runs from the backside of the femur (thighbone) to connect to the front of the tibia (shinbone). 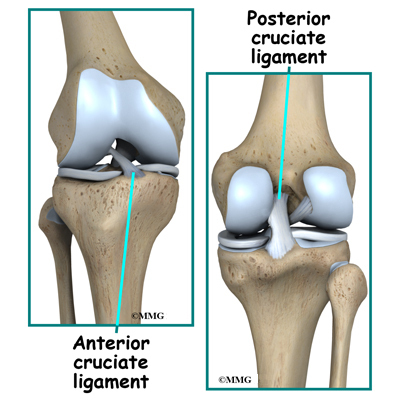 The Posterior Cruciate Ligament (PCL) is located near the back of the knee joint. It attaches to the back of the femur (thighbone) and the back of the tibia (shinbone) behind the ACL. When knee arthroscopy first became widely available in the 1970's it was used primarily to look inside the knee joint and make a diagnosis. Today, knee arthroscopy is used in performing a wide range of different types of surgical procedures on the knee joint including confirming a diagnosis, removing loose bodies, removing or repairing a torn meniscus, reconstructing torn ligaments, repairing articular cartilage and fixing fractures of the joint surface. Your surgeon's goal is to fix or improve your problem by performing a suitable surgical procedure; the arthroscope is a tool that improves the surgeons ability to perform that procedure. 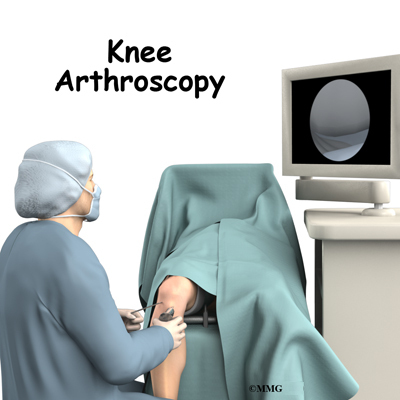 The arthroscope image is magnified and allows the surgeon to see better and clearer. The arthroscope allows the surgeon to see and perform surgery using much smaller incisions. This results in less tissue damage to normal tissue and can shorten the healing process. But remember, the arthroscope is only a tool. The results that you can expect from a knee arthroscopy depend on what is wrong with your knee, what can be done inside your knee to improve the problem and your effort at rehabilitation after the surgery. Before surgery you will be placed under either general anesthesia or a type of spinal anesthesia. In simple cases, local anesthesia may be adequate. Special braces are attached to the operating room table. These are used to safely cradle the leg and allows the surgeon to move the leg and bend the knee easily. Finally, sterile drapes are placed to create a sterile environment for the surgeon to work. There is a great deal of equipment that surrounds the operating table including the TV screens, cameras, light sources and surgical instruments. The surgeon begins the operation by making two or three small openings into the knee, called portals. 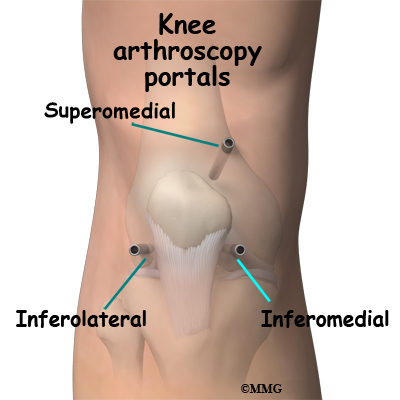 These portals are where the arthroscope and surgical instruments are placed inside the knee. Care is taken to protect the nearby nerves and blood vessels. A small metal or plastic tube (or cannula) will be placed through one of the portals to inflate the knee with sterile saline. 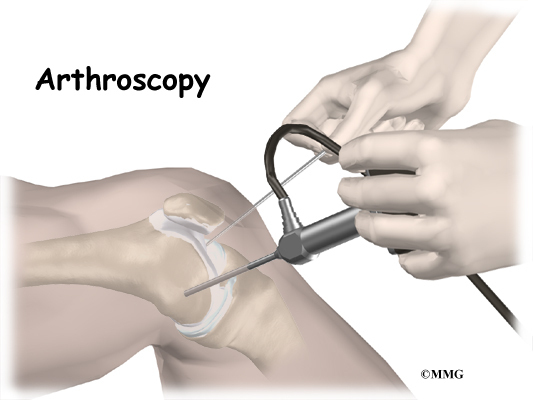 The arthroscope is a small fiber-optic tube that is used to see and operate inside the joint. The arthroscope is a small metal tube about 1/4 inch in diameter (slightly smaller than a pencil) and about seven inches in length. The fiberoptics inside the metal tube of the arthroscope allows a bright light and TV camera to be connected to the outer end of the arthroscope. The light shines through the fiberoptic tube and into the knee joint. A TV camera is attached to the lens on the outer end of the arthroscope. The TV camera projects the image from inside the knee joint on a TV screen next to the surgeon. The surgeon actually watches the TV screen (not the knee joint) while moving the arthroscope to different places inside the knee joint. Over the years since the invention of the arthroscope, many very specialized instruments have been developed to perform different types of surgery using the arthroscope to see what is going on while the instruments are being used. Today, many surgical procedures that once required large incisions for the surgeon to see and fix the problem can be one with much smaller incisions. For example, simple removal of a torn meniscus or loose body can be done using two small 1/4 inch incisions. More extensive surgical procedures such as ligament reconstruction or fracture repair may require larger incisions. Once the surgical procedure is complete, the arthroscopic portals and surgical incisions will be closed with sutures or surgical staples. A large bandage will be applied from mid thigh to the toes. Wrapping the entire leg with a compressive bandage reduces swelling and helps prevent blood clots in the leg. Once the bandage has been placed, you will be taken to the recovery room. Following knee arthroscopy, it is possible that a postoperative infection may occur. This is very uncommon and happens in less than 1% of cases. You may experience increased pain, swelling, fever and redness or drainage from the incisions. You should alert your surgeon if you think you are developing an infection. Infections are of two types: superficial or deep. A superficial infection may occur in the skin around the incisions or portals. A superficial infection does not extend into the joint and can usually be treated with antibiotics alone. If the knee joint itself becomes infected, this is a serious complication and will require antibiotics and possibly another surgical procedure to drain the infection. Many of the instruments used by the surgeon to perform knee arthroscopy are small and fragile. These instruments can be broken resulting in a piece of the instrument floating inside of the knee joint. The broken piece is usually easily located and removed, but this may cause the operation to last longer than planned. There is usually no damage to the knee joint due to the breakage. Different types of surgical devices (screws, pins, and suture anchors) are used to hold tissue in place during and after arthroscopy. These devices can cause problems. 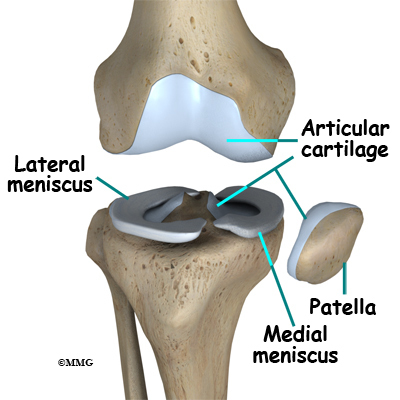 If one breaks, the free-floating piece may hurt other parts inside the knee joint, particularly the articular cartilage. The end of the tissue anchor may poke too far through tissue and the point may rub and irritate nearby tissues. A second surgery may be needed to remove the device or fix problems with these devices. Not everyone gets quickly back to routine activities after knee arthroscopy. Because the arthroscope allows surgeons to use smaller incisions than in the past, many patients mistakenly believe that less surgery was necessary. This is not always true. The arthroscope allows surgeons to do a great deal of reconstructive surgery inside the knee without making large incisions. How fast you recover from knee arthroscopy depends on what type of surgery was done inside your knee. Simple problems that require simple procedures using the arthroscope generally get better faster. Patients with extensive damage to the knee ligaments or articular cartilage tend to require more complex and extensive surgical procedures. These more extensive reconstructions take longer to heal and have a slower recovery. You should discuss this with your surgeon and make sure that you have realistic expectations of what to expect following arthroscopic knee surgery. Knee arthroscopy is usually done on an outpatient basis meaning that patients go home the same day as the surgery. More complex ligament reconstructions that require larger incisions and surgery that alters bone may require a short stay in the hospital to control pain more aggressively and monitor the situation more carefully. You may also begin physical therapy while in the hospital. The portals are covered with surgical strips, the larger incisions may have been repaired with either surgical staples or sutures and the knee may be wrapped in an elastic bandage (Ace wrap). Crutches are commonly used after knee arthroscopy. They may only be needed for one to two days after a simple procedure. Patients who have had more complex reconstructive surgery may need to wear a knee brace for several weeks. The brace helps to protect the healing tissue inside the knee joint. You may be allowed to remove the brace at times during the day to do gentle range-of-motion exercises and bathe. Follow your surgeon's instructions about how much weight to place on your foot while standing or walking. Avoid doing too much, too quickly. You may be instructed to use a cold pack on the knee and to keep your leg elevated and supported. Your rehabilitation will depend on the type of surgery required. You may not need formal physical therapy after simple procedures such as a partial meniscectomy. Some patients may simply do exercises as part of a home program after some simple instructions. Many surgeons have patients take part in formal physical therapy after any type of knee arthroscopy procedure. 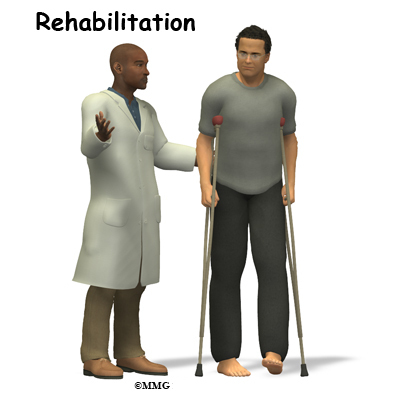 Generally speaking, the more complex the surgery the more involved and prolonged your rehabilitation program will be. The first few physical therapy treatments are designed to help control the pain and swelling from the surgery. Physical therapists will also work with patients to make sure they are putting only a safe amount of weight on the affected leg. Today, the arthroscope is used to perform quite complicated major reconstructive surgery using very small incisions. Remember, just because you have small incisions on the outside, there may be a great deal of healing tissue on the inside of the knee joint. If you have had major reconstructive surgery, you should expect full recovery to take several months. The physical therapist's goal is to help you keep your pain under control and improve the range of motion and strength of your knee. When you are well under way, regular visits to your therapist's office will end. The therapist will continue to be a resource, but you will be in charge of doing your exercises as part of an ongoing home program.